Languages have been my passion since I discovered the exciting world of English and French literature as a teenager. 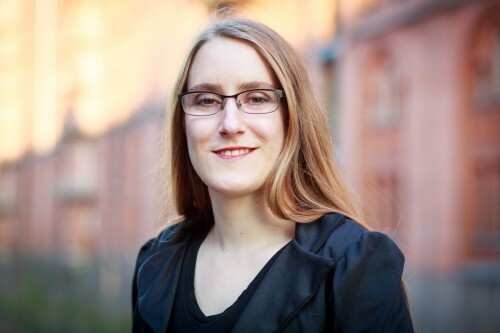 I studied English and French linguistics, literature and culture as well as foreign-language didactics with great interest and soon realised that I had found my future career in translation. As a freelance translator, I combine my passion for languages with my interest in technology and mostly focus on translations in the field of IT, such as the localisation of software and software documentation or websites. I am also very happy to translate marketing and advertising texts which often require a lot of creativity and a very good feel for the language in order to have the same effect in the target language. All orders will be processed by me personally – you will always know who has written your translation. The translation you receive from me will not only be factually correct, it will also consider the stylistic features of the text type and read well. For example, operating instructions require a different writing style to an advertising pamphlet. As a reliable partner for your translation projects I will answer your requests as quickly as possible, be at your disposal to answer queries at any time and dedicate myself to your project on an individual basis. I regularly engage in continual professional development in my specialist areas and consider consistently high quality to be the basis of my work. 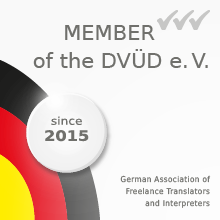 My membership of the respected German translator association DVÜD as well as in the International Association of Professional Translators and Interpreters IAPTI also obligates me to do this. You can expect professional use of the latest translation software; I will gladly process your orders with SDL Trados Studio 2019, memoQ or the CAT tool of your choice. Is it important to you that key terms in your text are always translated in the same way and a uniform image of your company is created? For each client I manage an archive containing all reference documents received from you as well as a translation memory with the translations previously completed for you in order to improve the image of your company with consistent translations. As an additional service, I can create a glossary for your translations for you at request. Once you have sent me the text I will send you a binding cost estimate so that you know the price of your translation straight away. The price calculation according to word count offers you a transparent and fair price structure. Is the translation required urgently? I deliver all translations punctually and in line with deadlines as a matter of course. If something needs to be delivered quickly, I can do this overnight or at the weekend for an additional fee. As an educated linguist, I am familiar with German, English and French linguistics and trained in the preparation of scientifically demanding and technically faultless texts. Are you looking for another language combination or an interpreter? Not a problem, I will not leave you in the lurch. I will happily recommend a reliable and professional translator or interpreter in my network for orders which I cannot take on myself.